Photo by Gabrielle Gopinath Lori Goodman,"Nests." In the background: Suk Choo Kim,"Tide Pool" and "Rock Slide." Photo by Gabrielle Gopinath Natalie DiCostanzo, untitled ceramic vessel. 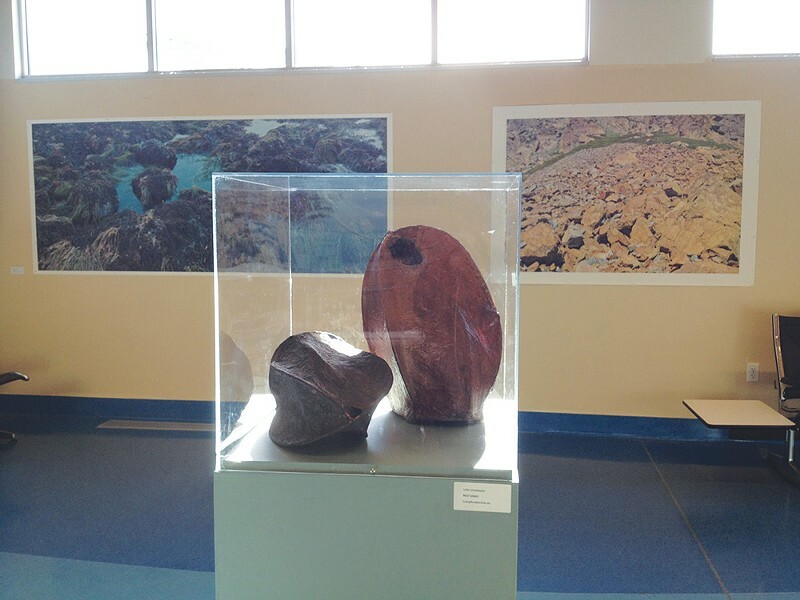 Not long ago, I found myself in the recently renamed California Redwood Coast Humboldt County Airport, looking at art. 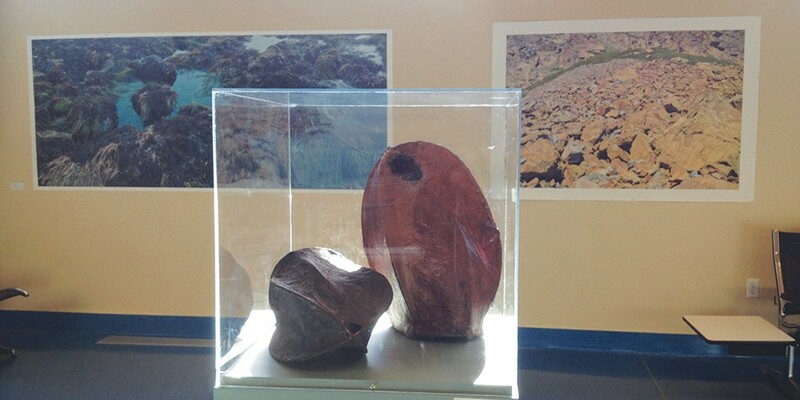 Perhaps you haven't given much thought to the airport as arts venue — me neither, until my delayed luggage turned into an occasion to contemplate works of art on display as part of the Redwood Art Association's Art at the Airport series. This chance encounter brought home an article of faith: You can learn something about a city by studying the messages posted at its entrances and exits, above all by seeking to understand the city's crude but energetic efforts at self-portraiture. At baggage claim my fellow travelers and I formed a semicircle around the single conveyor belt. Those of us not greeting loved ones bent over our phones. We were a captive, albeit distracted, audience. The walls in front of us bore glowing placards advertising ways to spend money in this county, casinos and college being the most prominent options. They were about matched in terms of the frequency with which they appeared, and one was sort of the mirror inverse of the other. The healthy, smiling young people in the ads for higher learning said, Better yourself! not with their mouths but with their kind eyes. Meanwhile, Money for nothing! was one of the promises the beautiful fun-loving women in the casino ads were cat-call whispering to travelers. The ads for Humboldt State University ("More than a university") and Blue Lake Casino ("Nightlife, Humboldt style!") shone from within like screens. Farther from the conveyor belt, large-scale photographic prints of landscapes hung on the walls. At our backs, vitrines were filled with Lori Goodman's sculptures. I saw them when I turned around. Even under the harsh airport lighting, in my jetlagged state, I could tell this had been an inspired selection. Goodman's "Nests," a set of meditations on exits and entrances, make perfectly good sense at baggage claim. Made from handmade paper stretched tightly over wood frames, they look like egg casings, seedpods or drums. The shrunken paper mimics substances ranging from tar to rawhide, sometimes taking on a glazed and crispy veneer reminiscent of Thanksgiving turkey. It behaves like the animal skins that stretch across the frame of a traditional sea kayak, puckering at the edges of the frame where it has been shrunk to fit. The nests' surfaces are riddled with pathways to the outside world. Some bear neat, paired perforations that look like ventilation structures; others have small, ragged exit holes punched through their surfaces, as though occupants had already hatched and flown away. Portals structure occupants' passage from one vessel of containment to the next. Other works of art on display took a different tack. Landscape photography was predominant. The large, colorful images by Suk Choo Kim, Thomas Allen Bethune, Jim Lowry and Stilson Snow that line the terminal hall offer no insight into airport space but speak eloquently to the natural magnificence of the Humboldt coast, from Bullard's Beach to the Ma-Le'l Dunes. Their appeal to viewers seemed more escapist: Here are some beautiful places where you could be right now, if you weren't in an airport. At the airport, art gets older, larger and more physically imposing as viewers rise above the ground. Taking the stairs from ground level to the lightly trafficked mezzanine means traveling back in time to the 1950s and '60s, when all of the works on display were created: a large, semi-abstract painting of the California coast, a streamlined chrome memorial to the county's World War II fallen and a metal sculpture depicting a pair of eagles fishing for salmon from a snag. Back on the ground floor in the south end of the hall, Natalie DiConstanzo shows shapely ceramic vessels in a variety of styles. Laura Zugzda, who photographs her black Friesian horses moving majestically through Humboldt fog, exhibits several of these images throughout the terminal. Turns out that Zugzda's Baroque horses are the closest things to protagonists on display. The human figure is completely absent, unless you count ads for casinos and universities. Every beach in these photographs is empty; there are no signs of human presence other than the implied one of the traveler-viewer before the frame. Every scene rests like virgin Eden, waiting to be activated by the quiet footsteps of the stoked but respectful viewer when he or she arrives on scene, making sure to leave no trace. Artists are on solid ground when they praise the beauties of this place. Visualizing our proper place within the magnificence remains more challenging. What should airport art be like, anyway? In the mid-1970s, Brian Eno thought he knew. He conceived of his landmark album Ambient 1: Music for Airports on a long layover in Cologne-Bonn; wearying of muzak, he dreamed of a continuously evolving ribbon of ambient sound. This soundtrack would help travelers manage their transit by underscoring every experience with a reassuring aural flow. It would allay anxiety and relieve ennui. And it would do all this by assuming the modest role of aural wallpaper, never once placing inconvenient demands on listeners' habitually overdrawn attention banks. I have never heard Music for Airports played in an airport. But Eno's experiment remains an interesting reference point because of the site-specific principles that shaped its form. It offered neither escapism nor diversion but a practically oriented way to pass the time. Art in airports becomes interesting not by seeking to efface the experience of travel, but by prompting traveler-viewers to reflect on our temporarily placeless condition. 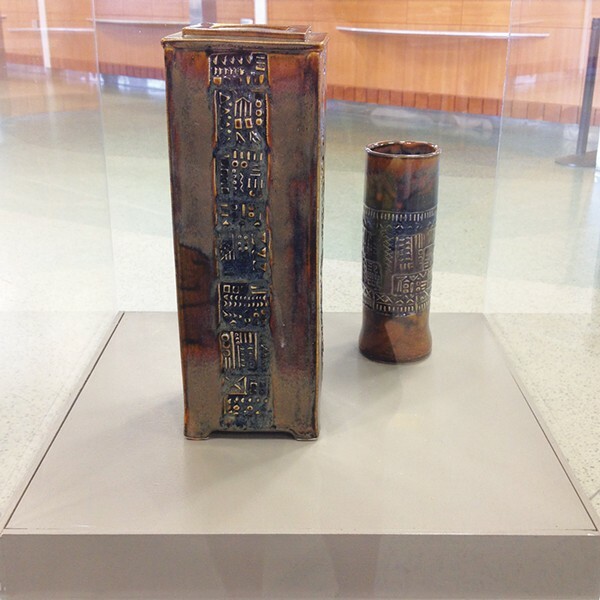 The Art at the Airport series is sponsored by the Redwood Art Association. Contact the association for prices or more details.